This course includes Lessons 21-25 from the Spanish Level 1 program featuring 2.5 hours of language instruction. Each lesson provides thirty minutes of spoken language practice, with an introductory conversation, and new vocabulary and structures. Detailed instructions enable you to understand and participate in the conversation. Practice for vocabulary introduced in previous lessons is included in each lesson. The emphasis is on pronunciation and comprehension, and on learning to speak Spanish. This course includes lessons 16-20 from the Spanish Level One program featuring 2.5 hours of language instruction. Each lesson provides 30 minutes of spoken language practice, with an introductory conversation and new vocabulary and structures. Detailed instructions enable you to understand and participate in the conversation. Practice for vocabulary introduced in previous lessons is included in each lesson. The emphasis is on pronunciation and comprehension and on learning to speak Spanish. This course includes Lessons 11-15 from the Spanish Level 1 program featuring 2.5 hours of language instruction. Each lesson provides 30 minutes of spoken language practice, with an introductory conversation, and new vocabulary and structures. Detailed instructions enable you to understand and participate in the conversation. Practice for vocabulary introduced in previous lessons is included in each lesson. The emphasis is on pronunciation and comprehension, and on learning to speak Spanish. Spanish Level 2 includes 15 hours of spoken language practice and one additional hour of reading instruction and is designed to be used after completing level 1. By the end of level 2, you’re speaking at a midintermediate level with near-native pronunciation, and you are comfortable meeting most social demands and limited job requirements. The beginning lessons of level 3 offer you the chance to expand your vocabulary and increase your fluency to an even higher level. You'll gain experience participating in many informal and some formal discussions on practical, social, and semiprofessional topics. You'll skillfully form longer, more complex sentences, and, most importantly, you'll find yourself being understood, even by native speakers unused to dealing with foreigners. The easiest and fastest way to learn Spanish. What’s included: thirty 30-minute audio lessons; 85 minutes of reading instruction in the form of a short story, allowing you to build your skills toward reading Spanish for pleasure; in total, over 17 hours of audio, all featuring native speakers; a reading booklet and user's guide. What you’ll learn: Building on skills taught in Spanish levels 1 to 4, Spanish Level 5 moves you closer to near fluency and adds a broad range of conversational skills. This course includes lessons 1-5 from the Castilian Spanish Level 2 program featuring 2.5 hours of language instruction. Each lesson provides 30 minutes of spoken language practice, with an introductory conversation and new vocabulary and structures. Detailed instructions enable you to understand and participate in the conversation. Practice for vocabulary introduced in previous lessons is included in each lesson. This course includes lessons 6-10 from the Castilian Spanish Level 2 program featuring 2.5 hours of language instruction. Each lesson provides 30 minutes of spoken language practice, with an introductory conversation and new vocabulary and structures. Detailed instructions enable you to understand and participate in the conversation. Practice for vocabulary introduced in previous lessons is included in each lesson. Whether you want to travel, communicate with friends or colleagues, reconnect with family, or just understand more of what’s going on in the world around you, learning French will expand your horizons and immeasurably enrich your life. 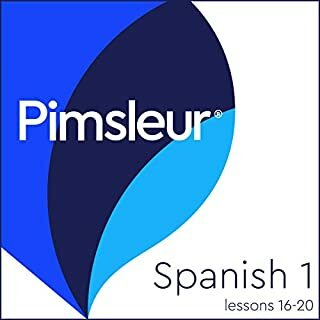 The exceptional thing about Pimsleur's French 1 is that in just 30 minutes a day for only one month, you can learn how to introduce yourself and get to know people, to order food in a restaurant, to ask directions, to go shopping - and that’s just the start. The Pimsleur Method: the easiest, fastest way to learn Spanish. Completely portable, easily downloadable, and lots of fun. You’ll be speaking and understanding in no time flat! Quick + easy - Only 30 minutes a day. Portable + flexible - Core lessons can be done anytime, anywhere, and easily fit into your busy life. Proven method - Works when other methods fail. Self-paced - Go fast or go slow - it’s up to you. Based in science - Developed using proven research on memory and learning. Cost-effective - Less expensive than classes or immersion, and features all native speakers. Genius - Triggers your brain’s natural aptitude to learn. Works for everyone - Recommended for ages 13 and above. This course includes Lessons 26-30 plus reading instruction from the Spanish Level 1 program featuring 3.5 hours of language instruction. Each lesson provides 30 minutes of spoken language practice, with an introductory conversation, and new vocabulary and structures. Detailed instructions enable you to understand and participate in the conversation. Practice for vocabulary introduced in previous lessons is included in each lesson. The emphasis is on pronunciation and comprehension, and on learning to speak Spanish. Reading lessons are included at the end of Lesson 30 to provide you with an introduction to reading Spanish. These lessons, which total about one hour, are designed to teach you to sound out words with correct pronunciation and accent. A reading booklet to be used with the audio lessons is included. Spanish is the official language of 19 Latin American nations. Further, it’s one of the six official languages recognized by the UN. Pimsleur's Spanish programs teach an educated Latin American Spanish, featuring speakers from Colombia and Mexico. Students can expect to understand the lessons clearly and to be understood by Spanish speakers everywhere.